We bought some oranges with leafs. I used them immediately for my painting. The leafs gave more texture to the composition. In addition, I had my subjects set on a reflective surface. Did I do a good job on painting the reflections? Hard to say. This one is a almost monochromatic painting. I am working on the values which I consider the most important element of a painting. I am back from my California trip. When I was in San Jose, my friend Hao give me a Japanese doll as a gift. I did this little painting. I hope you like it. The conference is over, but I am still in California. Today I went Palo Alto Art Center with two of my artist friends in the bay area. 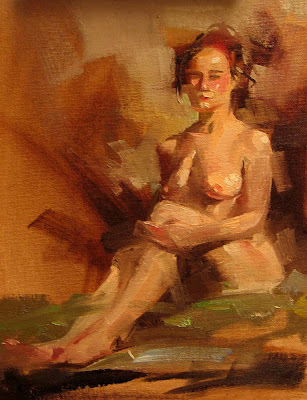 I did this oil sketch. I have not painted figures for a loooong time. It was a good experiment. If you like to have it. Please let me know. The price is $200 + $10 shipping. 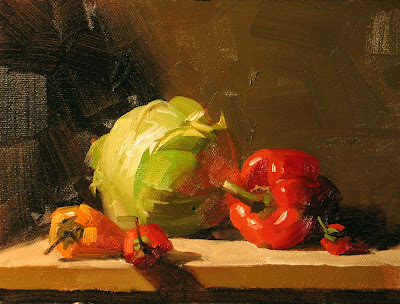 Painting cabbage and peppers are new for me, but they are fun objects. I really enjoyed when I painted this one. The cabbage has provided opportunity for practising edges, and peppers offered interesting shapes. I am going to San Jose, CA tomorrow for the Photonics West Conference. I may not able to post any paintings a week. It is a purely technical event. I have to wear a suit and talking technical gobbledegook for 4 days. On the surface, people sound sophisticated and look elegant there, but underneath I see the only universal driving power --- the MONEY. Unfortunately (or maybe fortunately), I am in the money game uncomfortably. Is there an alternative? This is my first time painting a pineapple. It is not great, so I am not going to put it on eBay. If you like to have it, please email me and make an offer. I have a feeling that I have entered a time of instability. There will be many new experiments I want to do. You might see my consistency is shaky. I may generate something good one day, and something bad in the next. However, I will keep my sanity checked all the time to make sure I will not turn into some kind of monster. Thursday night, I went to the Austin Table Tennis Club playing ping-pong. I was so bad. Anybody who played with me must felt bored to death. I ended it up playing with a robot most of the time. Anyway, it was a good exercise for me. Friday night I painted this painting as a visual diary, recording what I did. 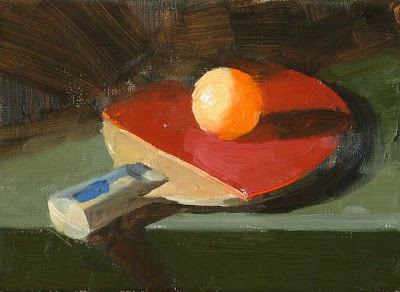 For this new subject matter, I don't quite know what I am doing, like I playing ping-pong. 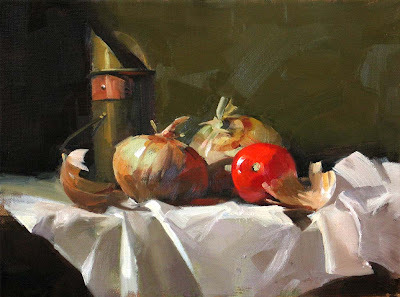 I am going to teach a 2-days still life painting workshop on April 26-27 at Austin, TX. For detailed information, please contact Carl Canga (carl@carlcanga.com). My previously posted message was misleading. It sounded that I am quitting doing daily paintings. I have received many emails and comments on my blog that I could not reply all of them individually. First of all thank you so much for your encouragement and support. I am not quitting. 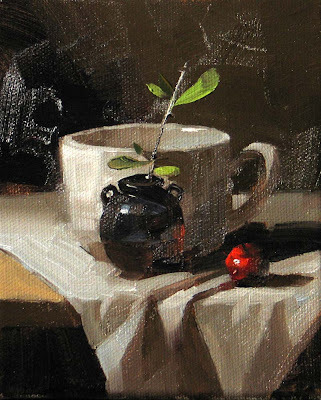 Last year, I really benefited from the daily painting practice. My paintings have improved significantly. For this year I will manage my art more flexibly to balance out my engineering job and other commitments. You have seen I posted more larger paintings lately. I will like to have the Nature take over, and I will do small paintings, large painting, and whatever. Talking about being a “being” artist, I think Robert Henri put it better: "The object, which is back of every true work of art, is the attainment of a state of being, a state of high functioning, a more than ordinary moment of existence. " 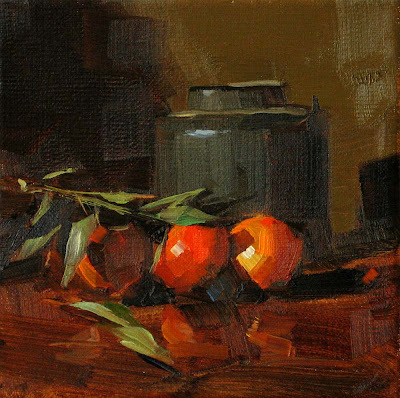 My today’s painting is a candidate for this year’s Oil Painters of America National Show. So wish me luck. I spent two days on it. You may have seen a similar one before. I am recycling some of my compositions and generate larger paintings with them. 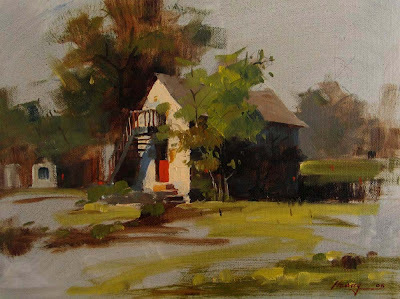 This is another plein air painting in the PAA member show. 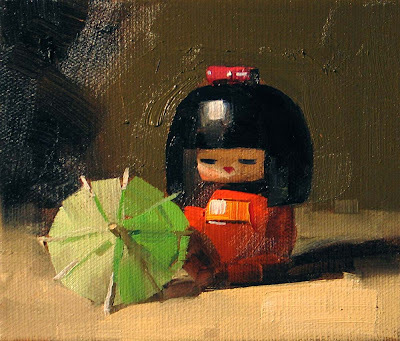 I was studying Richard Schmid at the time. I admire Richard's style a lot. 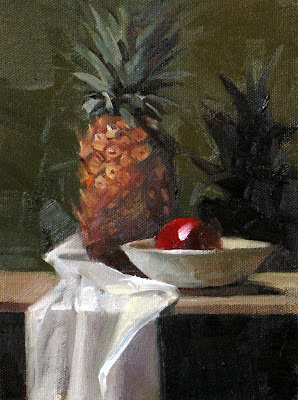 Well, I have not painted any still-lifes for quite a few days. 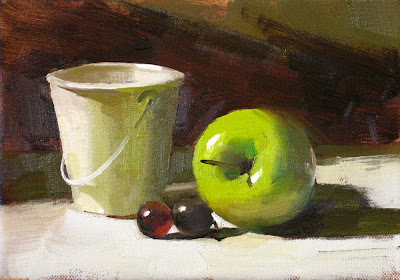 After the New Year, my daily-painting exercise has shown a trend of slowing down. I think it is normal. I admit that I pushed it a little too hard on my art practice last year, because I wanted to know how far I could go in a year as an armature artist. I felt good about what I have done, but I also owed a debt to my family and my health. For this year (if we are talking about my new year resolution), I want to learn more to be a "human being" instead of a "human doing", and make my art into my life more harmoniously. I will emphasize on improving the quality of my paintings, and bring better work for your evaluation in the near future. This is my second try of this green apple. Have I improved? Welcome 2008! A new year starts. I wish all of you all the best for this year. Well, I haven't resumed painting yet. This one I did a while ago, and it will be in the Plein Air Austin (PAA) Member Show at the Corridor of Arts, Chase Bank Building, Lower Level, 700 Lavaca in downtown Austin, TX from January 7, to February 29. If you are in the Austin area, please check it out. I don't consider myself a landscape painter, but I really enjoy plein air painting with a group of artist friends. 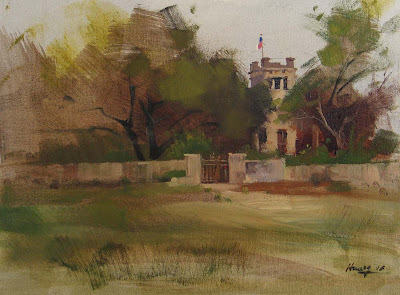 Plein Air Austin is a wonderful organization and I am really happy to be a part of it.